His Terrified Mind Sees Tomahawks in the Clouds, Hears Bullets Whistling in the Wild Western Winds. Reports from the Indian Country Colored With Everything but Blood. The Hungry Redskins to Continue to March and Dance and Threaten. CHICAGO, Nov. 23.—Notwithstanding the fact that to-day was Sunday, General Miles was at his desk early in the forenoon, as also were General Williams, Colonel Corbin and other United States army officers. It was after 2 Sunday morning when the commanding general left the headquarters in the Pullman building, after he had kept the wires hot with orders to the commanding officers with the troops in the northwest among the Indians. The first telegram received from the Indians came from an army officer at Rosebud agency, saying that information had been received that the hostile Indians are moving from Pass Creek toward Pine Ridge agency, in two parties—bucks with Short Bull along the White River route, the old men, women and children on the Medicine Root road. This news comes from Indians who have returned from Pass Creek, and Louis Richards says it is reliable. They report that they are going to Pine Ridge agency to get the Indians there to talk to the commanding general in their behalf. The report also says that Chief Two Strikes intends to stab the commanding officer as a signal for the attack by his band. There seems to be no doubt that the leaders mean war, and they are only using Short Bull as a pretense to keep the Indians together. General Miles says that the troops have been fully apprised concerning these matters, and provisions have been taken. I was at Poplar Creek agency for about six hours yesterday, after writing you my previous letter, and heard some additional items of interest concerning the feeling among the Indians there and elsewhere in this region. for nearly every warrior in the tribe. He says there have been few dances, nor is there great excitement, but he only knows two half breeds and one Indian who does not confidently believe in the new superstition, and it is the only topic of conversation. He says there is no talk of any hostility against the whites. I learned that White Gut, Sitting Bull's messenger, stopped at Poplar creek agency for a few hours last week, on his way back to Dakota, after visiting the Indians in the dominion of Canada. The agent did not seem to know this when I talked to him. White Gut reported that the Indians north of the line were richer and more prosperous than those who surrendered, finding a good deal of game, trapping and fur, and when they wished to work getting better wages than the Indians on the reservation. White Gut also said the Indians with Sitting Bull were better armed to-day than at the time of the Custer affair. He gave orders that if a hostile gun was fired at any time in Dakota or elsewhere, all the Indians everywhere must rise and do what damage they could, and go join Sitting Bull and Kicking Bear at Bear Butte in the Black Hills region. This is to take place in the spring. White Gut says the conditions are more favorable now for an Indian war than ever before, as the cattle are scattered everywhere through the country where the buffalo used to go in great droves, and one time a given section would have no buffalos in it for months at a time. 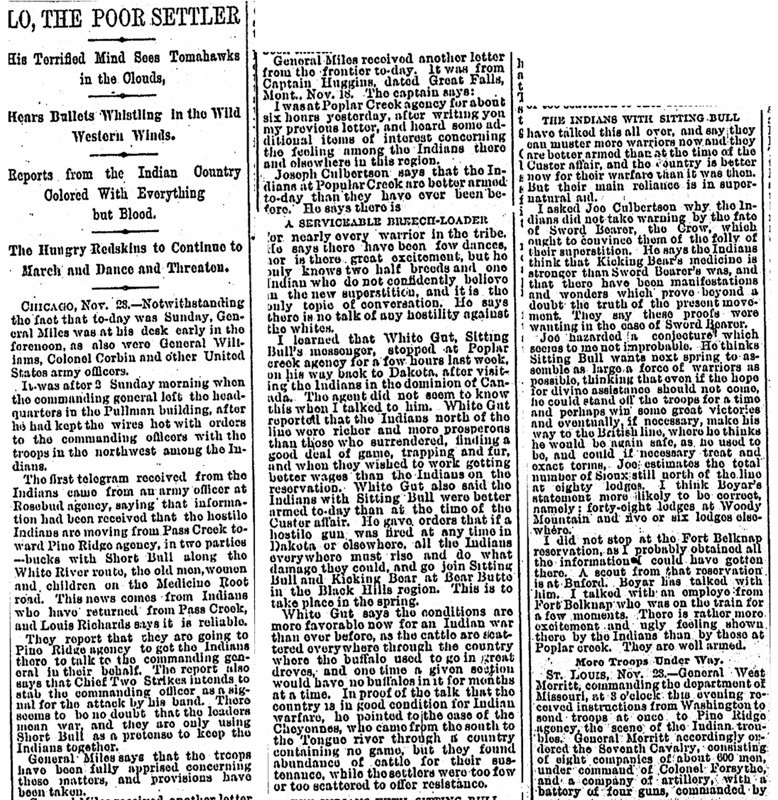 In proof of the talk that the country is in good condition for Indian warfare, he pointed to the case of the Cheyennes, who came from the south to the Tongue river through a country containing no game, but they found abundance of cattle for their sustenance, while the settlers were too few or too scattered to offer resistance. have talked this all over, and say they can muster more warriors now and they are better armed than at the time of the Custer affair, and the country is better now for their warfare than it was then. But their main reliance is in supernatural aid. I asked Joe Culbertson why the Indians did not take warning by the fate of Sword Bearer, the Crow, which ought to convince them of the folly of their superstition. He says the Indians think that Kicking Bear's medicine is stronger than Sword Bearer's was, and that there have been manifestations and wonders which prove beyond a doubt the truth of the present movement. They say these proofs were wanting in the case of Sword Bearer. Joe hazarded a conjecture which seems to me not improbable. He thinks Sitting Bull wants next spring to assemble as large a force of warriors as possible, thinking that even if the hope for divine assistance should not come, he could stand off the troops for a time and perhaps win some great victories and eventually, if necessary, make his way to the British line, where he thinks he would be again safe, as he used to be, and could if necessary treat and exact terms. Joe estimates the total number of Sioux still north of the line at eighty lodges. I think Boyar's statement more likely to be correct, namely: forty-eight lodges at Woody Mountain and five or six lodges elsewhere. I did not stop at the Fort Belknap reservation, as I probably obtained all the information I could have gotten there. A scout from that reservation is at Buford. Boyar has talked with him. I talked with an employee from Fort Belknap who was on the train for a few moments. There is rather more excitement and ugly feeling shown there by the Indians than by those at Poplar creek. They are well armed. ST. LOUIS, Nov. 23.—General West Merritt, commanding the department of Missouri, at 8 o'clock this evening received instructions from Washington to send troops at once to Pine Ridge agency, the scene of the Indian troubles. General Merritt accordingly ordered the Seventh Cavalry, consisting of eight companies of about 600 men, under command of Colonel Forsythe, and a company of artillery, with a battery of four guns, commanded by Captain Capron, from Fort Riley to the scene of the trouble. The troops left to-day by special train. General Merritt said: "I do not know how serious the trouble is, and of course cannot now say whether more troops will be sent or not. Of course they will be if necessary. I have no advices and have really no information to give further than that the orders were received from headquarters at Washington and I have acted accordingly." It is learned that every soldier in the department of Missouri is in perfect readiness to start for Dakota at a moment's notice. An Indian Assaults a White Woman. Considerable exitement was caused here last night by an assault committed by an Indian on Miss Dora Wright, a stenographer employed at the capitol. While on her way home at 6 o'clock in the evening she was accosted by an Indian, and when she tried to evade him, he struck her on the head with some blunt instrument and knocked her down. The scoundrel then fled. No motive for the assault is known, and it is probable he was drunk. Miss Wright's injuries are painful but not serious. Two Indians are under arrest, but have not been identified. To-day's advices from Standing Rock continue favorable. Rations were issued yesterday, and Agent McLaughlin reports only a small number of bucks away. The military authorities' count shows that a large number kept out, however, and a scouting party crossed the river to the east side to look up the wandering Indians. All the stores at the agency are closed an account of the excited state of the reds. An Indian council was held yesterday at the agency, and the friendly chiefs avowed allegiance to the agent and reiterated their opposition to Sitting Bull and the Messiah doctrine. Forts Lincoln and Yates are both being reinforced, and another company is expected to arrive from Fort Keogh tomorrow. The best informed people believe that there is a small probability of hostilities being begun before spring, and by that time it is almost certain that the war department will have troops enough in the vicinity to make any outbreak both dangerous and useless to the Indians. But in the meantime the country settlers are exposed to the threats and insults from roving bands, and are in constant fear of the results if the Indians should attempt a raid. An Associated Press correspondent has just returned from Fort Bennett and reports that the officers there say that no immediate trouble is feared. The Indians are skirmishing around in small parties, and the Brules are going to join the Cheyenne Indians at the ghost dance. Scouts are posted out to points near Cherry creek and as far north as Lebeau. Lebeau and Fairbanks are absolutely deserted, but the reports that seven whites had been killed near the former place are groundless. Trouble is feared if the Cheyennes are joined by the Pine Ridge Indians or vice versa. Indian carriers are constantly running between Pine Ridge and Hump's camp, on Cherry creek, and the Indians are certainly conferring on some important move, presumably the joining in a grand ghost dance. The authorities at Fort Bennett refuse to allow the whites to go west of there. "Stepps the Cripple" has arrived at Fort Bennett, having been driven by the Sioux of Hump's Two Kettles band. The excitement at this place in reference to the Indian trouble is at its height. General Bowers, with the Northern Pacific survey, reached here this evening. They say that the Indians are in a frenzied condition and are liable to commit murder at any time. Friday night, at 11 o'clock, 50 Indians surrounded their camp, 80 miles west of here, burst into the tent and took possession. They were all well armed and could have massacred the whole outfit, but after a powwow the reds left, being many miles away before the sun rose. Our people will ask the governor for arms and ammunition. It is feared that much damage will be done in proper precautions are not taken. The Indians on the Winnebago, south of town, have left to join the ghost dancers at Rosebud. Two Cavalry Regiments Ordered to the Threatened Point. WASHINGTON, Nov. 23.—Secretary Proctor did not receive any information to-day from the seat of the threatened troubles with the Indians. He had a consultation, however, with General Schofield respecting matters in the west. The regiment of cavalry which it has been decided to send to the Pine Ridge agency are the Seventh, now stationed at Fort Riley, Kan., and the Sixth, now in New Mexico and Arizona. The former, it is learned, started to Pine Ridge to-day. The Sixth Regiment is scattered at three or four different points in New Mexico and Arizona, and it will require some little time to gather these detachments together. The regiment has been instructed to be in readiness to move at a moment's notice. These regiments are subject to General Miles' orders. During the day Secretary Proctor received the following from Mayor Elliot, of Buffalo, Wyo. : "The only protection to this portion of the country is one small company of infantry. Our people have not arms or ammunition. Small bands of Indians are roving through the country. Scout Gruard believes this to be the objective point of the Sioux if they escape from the reservation. Send us troops or arms and ammunition that we may protect ourselves." Secretary Proctor says that all means necessary will be taken to learn the actual condition of matters in Wyoming. Mr. Belt, the acting commissioner of Indian affairs, is also without any telegraphic advices to-day respecting the situation of affairs in the district where trouble is feared. The agent at Pine Ridge yesterday requested authority of the Indian office to employ an additional number of Indian police to assist in maintaining order. This request, however, could not be granted, as the quota of Indian police provided for by law is about full. 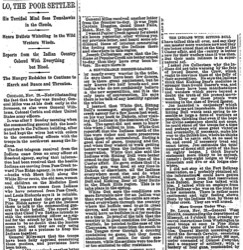 Subsequently Mr. Belt had a consultation with the secretary of the interior respecting the matter, the outcome of which was that the agent was authorized to employ fifty-five Indians as scouts. These scouts will perform the same duties and receive the same pay as the police. MANDAN, N. D., Nov. 23.—People continue to come in from the country bordering on the reservation. Provisions and ammunition have been moved into a coal mine, which is impregnable, and which citizens and settlers expect to be driven into. OMAHA, Neb., Nov. 23.—Latest reports from Pine Ridge are not so reassuring as those received last night. Short Bull and Jack Red Cloud, who have been leaders of the ghost dance at Rosebud, deny any hostile intentions and say the dancing has been stopped. The dancers are coming into the agency to-day in squads preparing to draw their rations to-morrow. The Indians mainly disclaim any hostile intentions. This attitude, however, does not satisfy General Brooke or Agent Royer. The fear is now that many of the dancers will decline to come to the agency for rations to-morrow, but will prefer to organize incursions to the country bordering on the reservations. In order that this phase of the question may be properly met, General Brooke has ordered a large body of troops to Rushville. The other troops in the department of the state are under marching orders and can soon be at the scene of trouble. It is reported that a band of Indian warriors, mostly Sioux, numbering about 6000, has been cut loose from the reservation below and is heading westward. CHICAGO, Nov. 23.—Wm. Cody (Buffalo Bill) has been ordered to the seat of Indian trouble and left to-night for Omaha. The Nebraska state militia was ordered to prepare for service at an hour's notice, by Colonel Cody, their commander.